If he’s a civilized person, where are his thumbs? In fact, where are COLIN’S thumbs? Civilized people don’t need thumbs, silly. Only pinkies with which to hold extended when drinking tea. And no, you don’t need other fingers to drink tea, you just need a straw in that case. Haha, I forgot about that one. The puppy can’t here because his ear has been broken a bit on panel 2!!!!! Colin’s kind of gone off the deep end this time. I love old-age Colin with his eye crinkles and glasses and kyphosis. 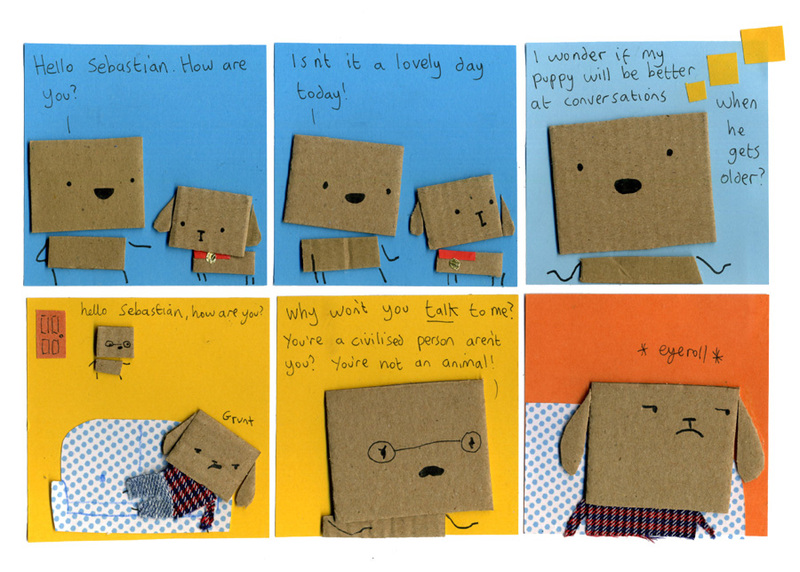 Grown-up Puppy is my favorite thing about MCL, other than paper and cardboard puns of course.